Time has passed quickly and many forget that the Chinese are out brothers. Media propaganda might have played the scene to destroy the Philippines-China relations but now, it has been restored. Guess what, Bongbong Marcos, the middle child and only son of the late strongman is also one of Duterte’s Philippine delegation. Filipinos in Beijing cannot hide their joy seeing in person the new Vice President of the Philippines if he wins the electoral protest. 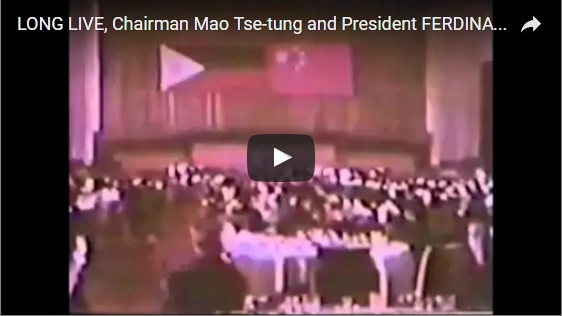 A documentary film on the State Visit of President and Mrs. Ferdinand E. Marcos to China in 1975 and the opening of diplomatic relations between the Philippines and the People’s Republic of China. President Rodrigo Duterte is not the first President who made friends with China. Way back in 1975, it was done by the late President Ferdinand Marcos. The Marcoses comprised it’s biggest delegation at that time. The class and charisma of the Marcoses are evident in this event. Something that Filipinos can be proud of. It cannot be denied that more Filipinos are longing for the Marcoses’ return to the highest office in the country. After all, the nation is more prosperous during Marcos’s 20-year reign. It was the time when Filipinos were so proud of the first family – wherever they represent the country to the world. Many are longing to make those times come back. Despite the resistance of the alleged martial law victims perpetrated by media propaganda. Previous joint ventures halted as soon as the outcome of the U.S.-backed EDSA revolution sets in. The Americans detest Marcos’s friendship with the Chinese. Naturally, as a pay back, the Aquino rulers must prioritize dealings with America over China. That setup deteriorizes when the China-U.S. rivalry arises. Despite poor deals, the Aquinos must stick to the Americans and disregard our Asian neighbor. The little girl giving flowers to Duterte in the welcome event during his state visit in China resembles that when the late President Marcos steps into the Chinese land at the airport. Joined with his family, they were welcomed warmly by Chinese leaders under the leadership of Chairman Mao Tse-tung. Poverty then during the Golden age was obviously blamed to the Marcos family. The American media were particular in using the former first lady’s 3,000 pair of shoes. They also came up hilarious accusations of Imelda’s expensive shopping spree. They assumed that they have stolen the money from the people even without proofs. Stealing money from the people is not one of Ferdinand E. Marcos’ many sins. The Aquinos should not fear the Marcoses. They are not violent people. They are just victims of media propaganda. The Marcos way is gentle, clever and diplomatic. It is about time that a Marcos take over the nation’s reign. Because despite the unfair treatments they have experienced, revenge is never in their hearts. The only way Philippines can heal.